For more than 20 years Pauliasi Luvu and Vari­nava Seresereqali of Sauva settlement outside Nausori planted just enough to support their families. Subsistence farming was the only thing they knew. For more than 20 years Pauliasi Luvu and Vari­nava Seresereqali of Sauva settlement outside Nausori planted just enough to support their families. Subsistence farming was the only thing they knew. But, last year the pair and two other farmers decided to go big and make commercial farming a reality. Their vision is to become the biggest farm in Tailevu. Returns from the farm is to help improve their homes and livelihoods. After the first year, both Mr Luvu and Mr Seresereqali know that the challenges of commer­cial farming are many. First, they had to clear virgin land, which is often ex­pensive. 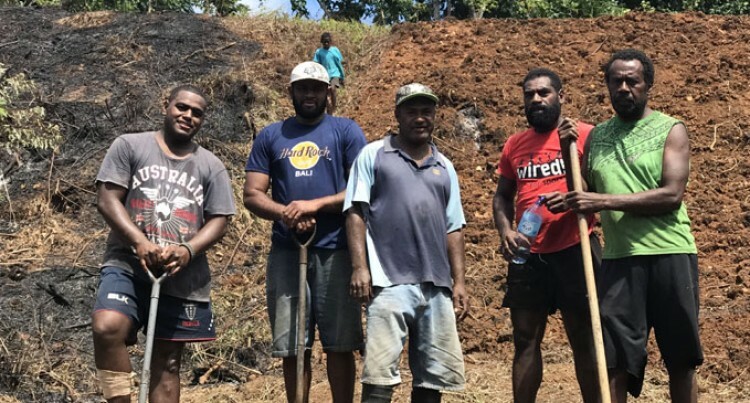 Mr Luvu and his team had to spend more than $12,000 to clear only five acres of the 40 acres of land called Boura, which belongs to the mataqali Rairaivanua of Naqeledamu Village, Bau, Tailevu. Boura is adjacent to Sauva settlement. The second biggest hurdle is that of land preparation. Since last year Mr Luvu and Mr Sereseredali have been manually preparing the soil and planting crops like dalo, tavioka and yaqona. It’s tough work with only four labourers. “The manual preparation of the soil is time-consum­ing. But, we are determined to make this venture a suc­cess,” Mr Luvu said. The harvesting season, he said also had its challenges. “We have to walk for at least one and a half kilometres to get our produce to the road,” Mr Luvu said. The wet weather makes the walk even more challeng­ing. Sauva settlement is located just 15 minutes outside Nausori along Dawakoto Road. In May, Prime Minister Voreqe Bainimarama had of­ficiated at the commissioning of rural electrification project in the area. The 20 plus families who live in the settlement are mostly from Naqeledamu Village. Since the start of their commercial farming venture, Mr Luvu said they’ve had consultative assistance from the Ministry of Agriculture. With their help, the Boura farmers will try out ginger farming until the end of the year. For the time being, most of their products are sold to middlemen/women at the Nausori Market. Sales from dalo are doing well at the moment, given its shortage. “We are treating this venture as any 8 am to 5 pm job. We’ve seen that it’s brought us together as farmers and created unity in our community,” Mr Luvu said. Despite more and more Fijians turning to private farming and land ownership, Mr Luvu and the Boura farmers believed that the iTaukei concept of solesole­vaki is an integral part of their venture. It’s the only way they can make a break into commer­cial farming.